You can configure your Shipwire account to allow for one, or more users, to access it. Shipwire has the notion of four Account roles (or types): Administrator, Full Access User, API, and Customer Service. The account holder is essentially an Administrator, which allows this person to control who else has access to the account (whether API or other user types), while still having access to the rest of the Shipwire software functionality. 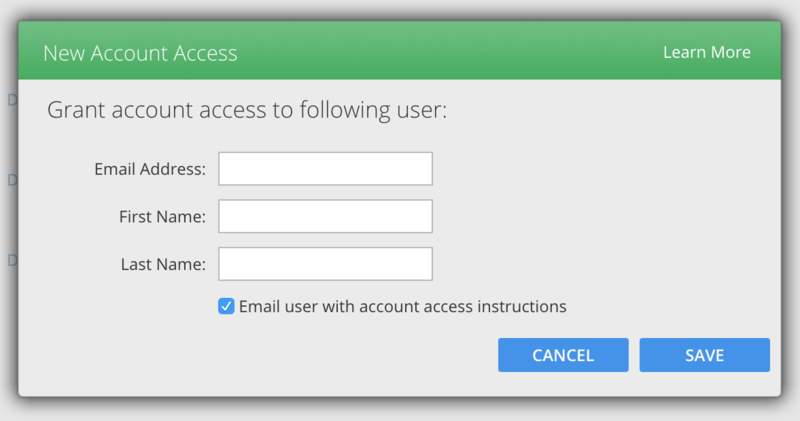 The Full Access User role is granted similar privileges as the Administrator but they cannot grant (or remove) access to other participants. They also cannot use their credential information to access the Shipwire API (also used in some cart connections). Once they have been provided with a login and password by the Account Administrator, they will have full access to the Shipwire user interface. The Customer Service role is granted limited privileges in the orders tab and individual order details for minor editing. They cannot view sensitive pricing information on the main Dashboard page or edit the product catalog. They cannot grant (or remove) access to other participants, and they cannot use their credential information to access the Shipwire API (also used in some cart connections). Once they have been provided with a login and password by the Account Administrator, they will have limited access to the Shipwire user interface. Shipwire access for API roles are restricted to API-only communications. This type of access is useful for certain cart connections, and for custom integrations. Someone who is granted API access will not be able to login to the Shipwire interface. We recommend that you create a separate API user for each cart connection and custom integration that you use. NOTE: If you are looking to move current API access from your Administrator role over to a new API role, please read this help article to ensure a smooth transition. Setting up a new role is simple. Go to Account Profile, and ensure that you are logged in as the Administrator. Locate the Account Access and click on Add new. Select the type of account you would like to create. 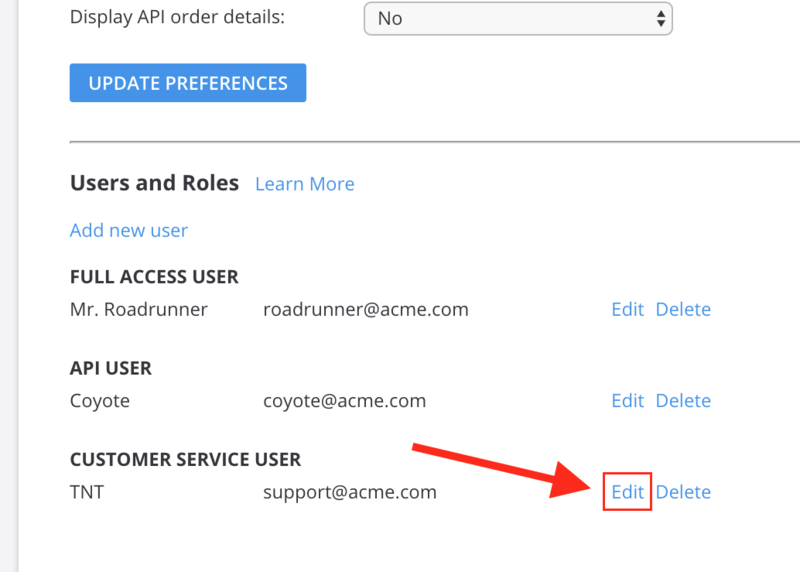 For user roles, we allow you to forward an email to the new user, and/or we can send the new account information directly to you. You will be able to select a password for a user role. For API roles, Shipwire will auto-generate the required password (also called a “key” or “token”) for maximum security. Enter the email, first and last names for the new user. If you are creating an API user, we recommend using a fake email address such as Name_of_cart_to_be_connected_to_shipwire@yourcompanyname.com and unchecking the option to “Email user with account access instructions”. This will cause the administrator to receive an email with the API password details for this new user (rather than an email going to an invalid email address). Once complete, you will receive a confirmation screen. As an Administrator, know that you can always limit your account access at any time, simply by deleting or editing existing users, and/or API connections. There are also 2 things worth noting when limiting and editing account access: 1) Any information that is already obscured in your interface will be obscured for other user roles and, 2)For any role changes (i.e. a Full Access User role being changed to a Customer Service role) an email will be sent to the associated account being edited prompting for a brand new password login, the old password will no longer function. Q. Can I request specific changes to a role? For example, can I request that a Customer Service role gain access to the Inventory tab as well? A. Unfortunately all of our roles are predefined and we cannot support customizations. Q. How do I change an existing role over to a new role? For example, I would like to change one of my Full Access User roles to a Customer Service role. A. You can edit any existing role to a new role. The steps on how to do this can be found above. Please note that roles are linked to the email address that was used to sign up for it, hence an email address cannot be used for more than 1 role. 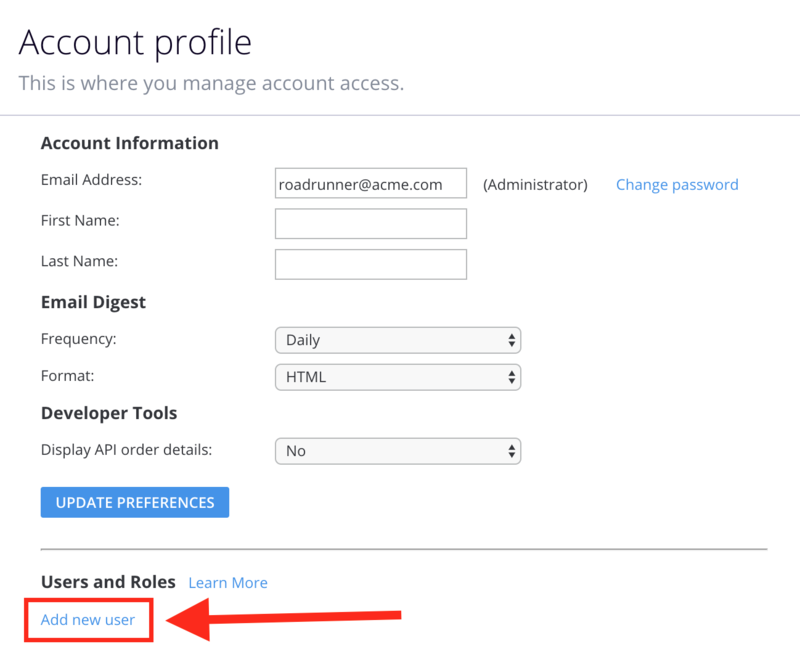 For example, if you wanted to move a Full User Access role to a Customer Service role, you would have to edit it within the Account Access page. Q. Once I edit an existing role to a new role, do they just use the same login information? A. Once a role is edited, the user of that role will receive an email message prompting them to choose a new password. The old password will no longer work but the login email will remain the same.